The wider property market may be experiencing a touch of slowdown, but the warm weather we’ve had over the last couple of weeks will have been a spur for many of you to get stuck into your bespoke home building projects. 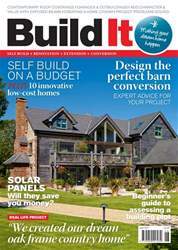 With plenty of daylight hours to enjoy, it’s the perfect reminder of the benefits of bringing more natural brightness into your home – whatever the season – and this month’s issue of Build It comes bundled with our free guide to Choosing windows & doors. Whether you’re specifying a full self build, creating a kitchen-diner extension or simply looking to upgrade your home’s fenestration, it’s packed with all the inspiration and advice you’ll need to get your glazing right and successfully bring the outside in.